Traveling always seems exciting, but along with it comes a 101 different things that you have to worry about. How many outfits to bring, where to visit for best Instagram-worthy spots, and 2038974392 beauty and skincare items. You might choose to skimp on your makeup or on your other steps in your regular skincare routine like face masks and serums, but cleansing is a step that cannot be skipped. While I was at a preview of the Japanese drugstore Welcia BHG just before it opened, I was given a pack of Suisai’s Beauty Clear Powder that locals and tourists in Japan both love to use, especially on their own travels. Powder cleansers are quite popular, though it seems like Suisai’s Beauty Clear Powder is one of the more popular ones. While packing for a short weekend cruise, I decided that there was no better time to try these little hexagon capsules to see if they are as good as everyone says they are. So I tossed three into my skincare pouch, marvelled at all the extra space I had, and headed off. Here’s what I thought of the cleanser after using it for an entire weekend. What is it: A facial cleanser that comes in powder form, packaged into little hexagon packets for one-time use. As you can see, the little capsules are really tiny, and hold just the right amount of cleanser to cleanse your face once. The directions are also pretty straight forward; just add water and lather the milky liquid into a handful of foam before applying it to your face. The Suisai Beauty Clear Powder contains two different enzymes and amino acid cleansing ingredients that will exfoliate your skin by removing keratin plugs, residue in pores and reducing roughness. Pros: After just one use, I did feel that my face was slightly smoother, and that my nightly routine of toner and moisturiser didn’t feel as heavy. My face was left squeaky clean, but not in a drying kind of way. I also didn’t have to worry about squeezing out too much product or about spillage in my luggage. 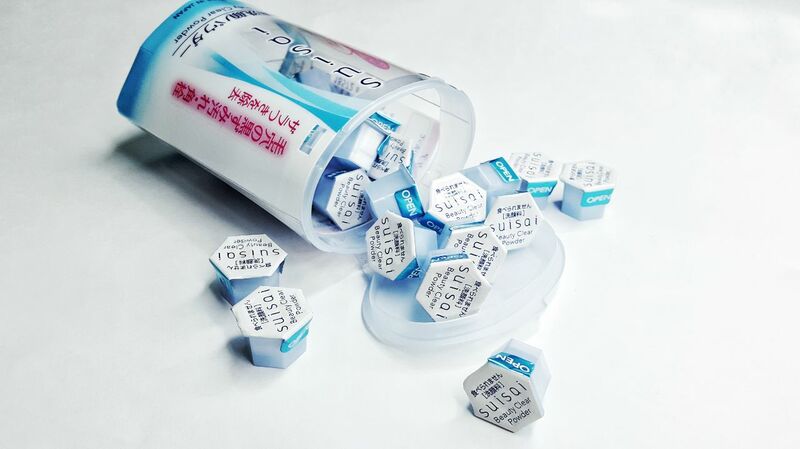 It’s not hard to see why everyone loves these little capsules from Suisai so much. Cons: While the convenience is great, the price wasn’t that wallet friendly. Each pack, which contains 32 pieces, goes for $27, meaning that it would only last me a month, and half a month for those who wash their faces twice a day. I could get more product out of a facial cleanser from another Korean beauty brand for a cheaper price which niggled at my inner aunty instincts. I was really happy with the cleanser throughout my entire weekend trip – my face felt smoother without me having to use a separate scrub and I didn’t have all that hassle of struggling to open little sample sachets with wet hands. Until I came back in the middle of the day and felt so gross and oily that I had to wash my face, breaking my normal routine of only using cleanser once a day. I realised that I didn’t have enough capsules to last me till the end of my trip, so the other downside is that you might run out of cleanser if you didn’t budget carefully or dropped a couple somehow (these are so tiny, I’m pretty sure I lost a few too). Alternatively, you can also use half of the capsule to save the other half for later, but the powder dries up quickly once opened. Would I still buy it: Yes, if I was going traveling and really didn’t want to carry a lot of dead weight around. The cleanser also doubles up as gentle exfoliator, which you can easily work into your weekly skincare routine even if you aren’t traveling. This facial cleanser is too expensive to use on a daily basis even if you stocked up on them in Japan (it’s about $24 for 32 pieces in Japan), and the daily exfoliation might be a little too much for the skin to handle too. 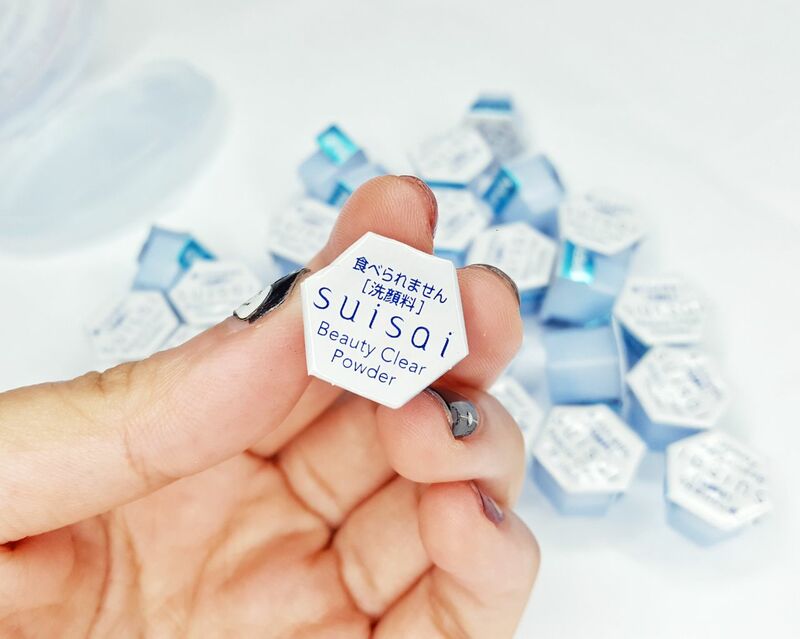 The Suisai Beauty Clear Powder, $27 for 32 pieces, is available at BHG Welcia in Bugis Junction. Does Consuming Collagen Actually Give You Better Skin?